It was nearly closing time at the Library and as usual I was bewildered on what to pick and what not to. The Librarians were politely, but firmly telling the patrons that they need to make their choice in the next 10 odd minutes and I was still unsure about the last book I wanted to borrow in my allowed membership quota of 5 books for 3 weeks. With very little time to spare, I randomly picked up a book lying on top of a pile of the latest returns. 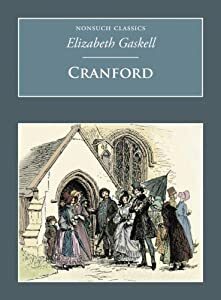 It was only while I was getting the issuing formalities completed, I realised that I had picked up Elizabeth Gaskell’s Cranford. I was not very happy, but by then it was too late to change the selection. So I was stuck! I had read Gaskell’s North and South and I was really not in the mood for another Bleak House meets Industrial Revolution. There is an old old adage – Never judge a book by its cover. In case of Cranford, I realised this was applicable literally. Before I discuss the book, let me give you a short overview of its author. Elizabeth Gaskell was born in 1810 to a Unitarian Minister turned Keeper of Treasury Records and was brought up by her aunt, at Knutsford, after her mother’s death, barely 13 months after her birth. She had an elder brother who joined the East India Company fleet but went missing during an expedition in 1827. In 1832, she married William Gaskell and settled in Manchester, where her husband was a Minister at the Cross Street Unitarian Chapel. She had four surviving children – Marianne, Margaret Emily, Elizabeth Florence and Julia. She began her literary career initially by co-authoring a book of poems with her husband which was published in 1837. In 1848, she published her first novel Mary Barton. Following the publication of this novel, Mrs Gaskell and her family moved to Plymouth, where she would write her remaining works, while her husband managed many welfare committees. Their house soon became a centre for gathering of intellectuals, religious dissenters, and political reformers and their friends included, William and Mary Howitt, Charles Dickens and John Ruskin. She became a contributor to Charles Dickens’ Household Words. Her most famous works includes, North and South, Wives and Daughters and Cranford. She dies of a sudden heart attack in 1865. Mrs Gaskell wrote from her real life experiences and was influenced by what she saw and observed around her. North and South is a testimony of her life and observations in the industrialized Manchester. Written from a perspective of a young woman Margaret Hale, who settles in a fictionalized industrial town of Milton, where she witnesses the harsh and unhealthy conditions of the factory workers and is forced into confrontation with John Thornton, a cotton mill owner. The story is a vivid and sometimes depressing, but true portrayal of poverty and oppression of the mill workers. It does not make for a light reading and in the light of such memories, it was but natural that I was not looking forward to Cranford. But this is where I really underestimated the flexibility and the capacity of creative ingenuity that Elizabeth Gaskell possessed. Based on her years in Knutsford, Cranford is slow, leisurely walk down the Victorian society and her social mores, bringing out the generosity of people who has very little to give and documenting the irony and humor of everyday lives. The book is really a series of events and happenings centered on Cranford and Ms Matty Jenkyns and other characters of Cranford including Miss Pole, the first lady of Cranford Mrs Jaimeson, Thomas Holbrook, Captain Brown and Lady Glenmire. The small town of Cranford is ruled by the ladies and everyday revolves on appearances of gentility (which is really a covert attempt to mask Poverty, because to discuss poverty is so vulgar! ), card games, tea and friendship. It revolves around incidents like the collapse of a bank, a titled lady who stoops to marry a common surgeon, and cows in flannel pajamas (I told you this book is funny!) and finally the return of someone from the past. ← Oops I or (did he) do it again!! !